Disclaimer: The following is base on my own best recollection. We’ve been down some interesting, and often wayward, school improvement paths in Arkansas. I recently came across a school improvement document written for my present school back in the early 1990s. It was called Comprehensive Outcomes Evaluation (COE). We had a similar plan where I was teaching in south Arkansas about that same time. It was nice and thick with a pretty cover. I should have held onto it for future reference and a few laughs. But, the thing is, it wasn’t funny because educators had invested time in this plan. Research to support why you were doing what you were doing was not necessary, and results were not tracked. It was just a litany of things to do that MIGHT improve student learning in your school. Areas to improve included almost everything. There were goals written for literacy, math, and science, social studies, and school discipline. I’m not sure how the arts and physical education escaped being topics for improvement. 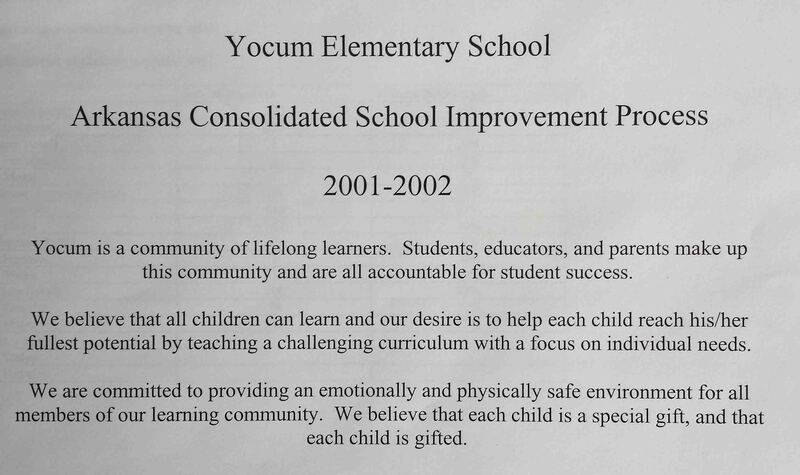 A few years later I became principal at Yocum Elementary School in El Dorado. Leading this school was a wonderful experience. After being there a few months, I unearthed their COE. I almost cried. It had lists of task in each content area involving all staff. I read it and then placed it on my shelf. I learned that my predecessor and one teacher had stayed in the office for a couple of weeks, writing that COE with no input from staff. I never referred to the document again, but harbored the hope that we would involve teachers in the development of our COE. The last ACSIP I worked on with teachers at Yocum Elementary before moving to Alma Intermediate. The name changed sometime in the late 1990s. The word “Outcomes” from COE became a politically loaded term. The new name was Arkansas Consolidated School Improvement Plan (ACSIP). 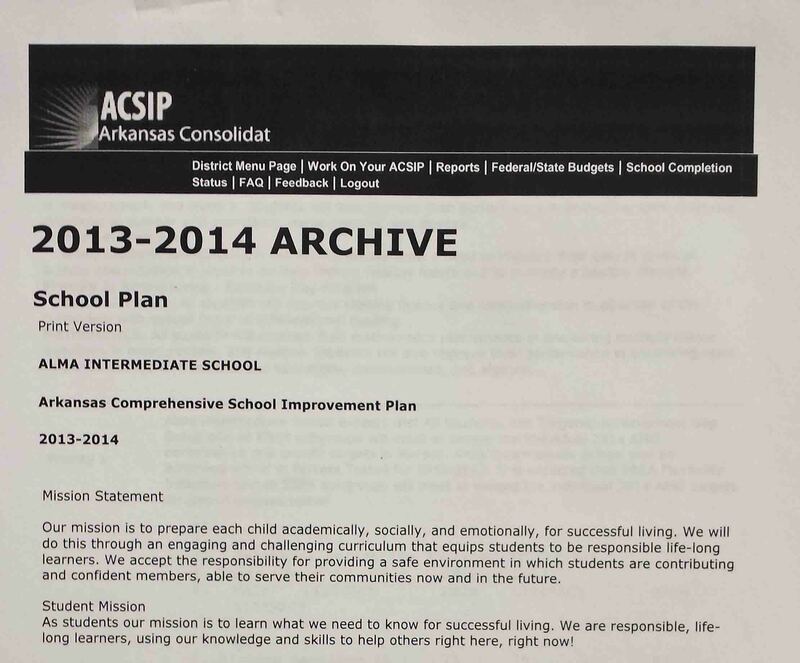 Later, the term “Consolidated” acquired negative connotations due to controversial consolidation of smaller school districts, so the name was changed again to Arkansas Comprehensive School Improvement Plan (still ACSIP). Over time the ACSIP lived up to the term COMPREHENSIVE. Our school improvement plan which included a wellness section an many prescribed items. The Mission Statement and portions of the plan were developed by our teachers. What we ended up with was the humorous, yet tragic, spectacle of a Health and Wellness committee as part of the school improvement plan. The State Department of Education prescribed goals to improve student health and lower the body mass index of students (BMI). Thanks to state legislation, we had school improvement actions stating how many times per year we could offer students snacks in school. I support physical fitness (see my other blog) but do not think this has a place in the school improvement plan, unless a staff makes it their priority. We’ve puttered along for several years now, watching our ACSIP swell in size and shrink in impact. Finally, we had a State Department of Education Commissioner and a couple of legislators who listened and realized that the ACSIP needed to change. We were so excited about this development that we gladly signed up to be a pilot school in the new program being used to enter school improvement goals and actions. I’ve continued to hold the belief, though sometimes fleeting, that it is possible to have a school improvement plan that truly influences the direction of the school and improves student learning. This short history brings us to the present and our attendance of a day of training at the Convention Center in Fort Smith in September. We entered the room with our laptops in hand, looking forward to learning how to use the new web based program to document real school improvement planning in our school. At 1:15 p.m. we still had not opened the program together or gotten our hands into the real work. We were frustrated! What we endured that day was a remediation course in school improvement. I expressed my frustration in a letter. I was troubled that this opportunity to build on our enthusiasm was squandered. Our district’s technology trainer worked with us later, accomplishing in 1.5 hours what was not accomplish in a whole day with the state training. We maintained our enthusiasm and are now on the path of possibly making the ACSIP a meaningful school improvement process for our school. My hope is that we don’t end up adopting the name, “Arkansas Prescribed School Improvement Plan.” Our best defense against this is to become deeply engaged in making our school improvement plans real, while guarding against the incursion of distant forces who think they can best prescribe to the needs of our school. I choose to be hopeful. It will be interesting to see where we go from here. By ozarkmountainhiker in Uncategorized on October 12, 2014 .